Sen. Art Linares gives testimony in the Connecticut Senate. AREAWIDE — State Senator Art Linares (R-33rd) on Wednesday testified before the legislature’s Government Administration and Elections Committee in support of a bill he proposed to give the 2nd Congressional District its own vote in the Electoral College. 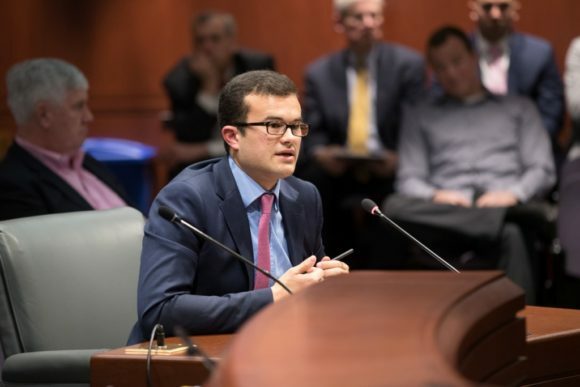 SB 133, An Act Concerning The Electoral College Vote Attributed To The State’s Second Congressional District, was submitted by Sen. Linares as a way to give a voice and more visibility to the people and businesses of the 2ndCongressional District. During his testimony, Sen. Linares said that while people know the Naval Submarine Base and the U.S. Coast Guard Academy, other areas of the district don’t get much notice.